The Master Lock No. 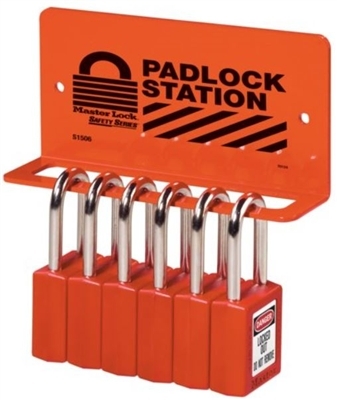 S1506 Heavy Duty Padlock rack features heavy gauge steel with durable powder coat finish to ensure long life in manufacturing facilities and the 6.25in (159mm) wide rack holds 6-8 padlocks. Includes labels in English, Spanish/English and French/English.